Dothan Mayor Mike Schmitz presenting the AAA team with a proclamation declaring today is Amputees Across America Day. He also honored us by riding his bike into the facility with us. 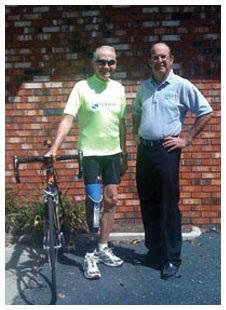 A Special Thank You To Mike Reith of St Pete Limb and Brace. It's Sunday afternoon and I'm resting in my hotel and I just took the pix you see below. When a person begins a journey like this, they usually do the usual things; decide on clothing, helmet, gloves, bike shoes, etc. Next, the bicycle, seat, all related equipment in proper working order and all else related to the adventure. But, when I started this trip there was another piece of equipment that must be carefully considered. This vital device makes my odyssey possible. Without it's flawless performance things would come to a halt. Generally, you can repair your bike on the road but, not so easy with this. Here is something that must help propel without breaking, fit with comfort, and not create tenderness that quickly transforms to pain and having to cease motion. End of ride. You can imagine the number of revolutions it turns out on such a ride. Having said all that, I must say with gratitude a special thank you to the man who's talent and hard work makes it possible: Mike Reith of St Pete Limb and Brace. A friend and my biggest helper in making it possible. Well it is TV time....Miss you all, Bill. When Doc Milligan and Jeff Martin lost their legs, they didn’t lose their hope. Now, they’re out to spread that hope to fellow amputees as part of Amputees Across America. Along with three other amputees, Milligan and Martin began a cross-country bicycle ride on June 1 in Tustin, Calif., and stopped at HealthSouth Rehabilitation Hospital in Dothan on Friday morning en route to their final destination, Vero Beach, Fla., where they hope to arrive July 22. Got some new pix. Again, not just the road but, the people we spent time with in some HealthSouth rehab facilities. We were in front of TV cameras for an interview, in Montgomery, AL with host Tonya Terry. A Beautiful Young Girl Named "Em"
Hope you all enjoyed your July 4th Holiday. Haven't posted for awhile. Been spending more time with patients and am including a pix of a beautiful young girl named Em. Em had her leg amputated as a choice to correct a bigger problem that prevented her from enjoying her young life. That choice was validated when she and her parents saw the ESPN article about my little friend Jake Bainter from Orlando, FL who made a similar choice. It's amazing how the world works to support other people from the loving and compassionate acts of others. Included will be pix of the other side of this ride. I offer this as a balance so you may see what is being done. As always my friends, I miss you. Here is a pix of a patient that got so motivated that he started walking and continues for over an hour until tired. He's had that leg (prosthetic) for over a year and never got out of his wheelchair. Now he won't sit down...isn't that great. That's a miracle. We're in Montgomery this morning (AL) great place to ride. I can smell home and missing it more each day. Will be in GA. after the Holiday. Will report again soon. Wishing you all a Happy 4th of July. Have a great day, and of course I MISS YOU ALL! Abel Cruz discovered Amputees Across America at precisely the right time. The 60-year-old resident of Albuquerque, N.M., lost his left leg in August 2005, when he was injured in a motorcycle accident just east of Monroe. Cruz, who was riding to visit a friend near Hattiesburg, Miss., was hit by a wayward tractor-trailer tire. His left leg was crushed in the crash, fracturing in several places and unable to be saved.